In a rapidly growing fields of Social Media, Search Engine Optimization and Digital Marketing Strategy, the consulting arena is suddenly overflowing with agencies claiming the title of “expert.” Melanie Yunk, company founder knew its potential impact, well before its time and is definitely one of those people who fully grasped this concept early on. She had the vision to see the significant impact the understanding and implementation of a social media strategy would have on business communications. Our branding challenge was to differentiate her new consultancy from competition and communicate her unique attributes in a bold, relevant manner to a broad base of current and potential new clients. Based on a thorough review of competition and in-depth analysis of her business plan, a new brand platform was first created. The new name, identity, and graphics for this innovative SEO/social media consultancy were created from a unique brand essence of “building customer engagement.” The new brand effectively differentiates Roaring Pajamas from its competitors while communicating the unique attributes of its founder. Consistent application to print and digital audience touch points insures maximum efficacy and efficiency in brand building. 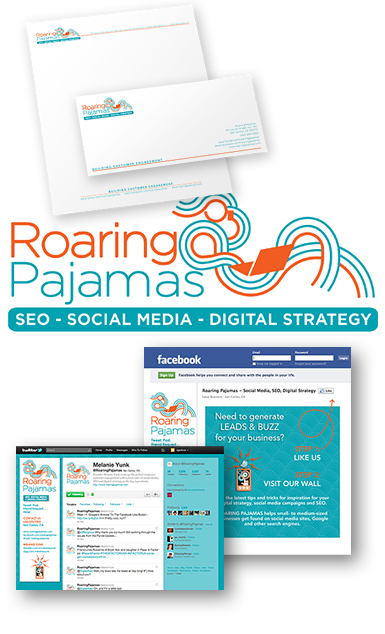 Roaring Pajamas was successfully launched in January, well received in the marketing press and is already landing new clients. For more information on this innovative new agency, visit www.roaringpajamas.com.